I will not break the custom of joining to my offering a prayer; and it is, that your Majesty will be pleased to pardon this following short apology for my Leviathan. Not that I rely upon apolo gies, but upon your Majesty's most gracious gene ral pardon. Excerpt from The English Works of Thomas Hobbes of Malmesbury, Vol. 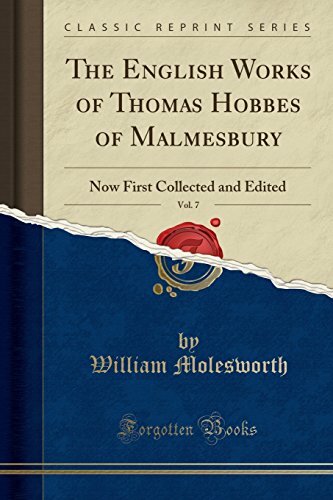 7: Now First Collected and Edited The English Works of Thomas Hobbes of Malmesbury: Now First Collected and Edited was written by William Molesworth in 1845. This is a 475 page book, containing 140293 words and 22 pictures. Search Inside is enabled for this title. About the Publisher Forgotten Books publishes hundreds of thousands of rare and classic books. Find more at www.forgottenbooks.com This book is a reproduction of an important historical work. Forgotten Books uses state-of-the-art technology to digitally reconstruct the work, preserving the original format whilst repairing imperfections present in the aged copy. In rare cases, an imperfection in the original, such as a blemish or missing page, may be replicated in our edition. We do, however, repair the vast majority of imperfections successfully; any imperfections that remain are intentionally left to preserve the state of such historical works.